There are people you meet that you remember. Felicia was one of those. There are people you think about getting to know better and hope it happens. Felicia was on my list. There are people taken too early from this world. Felicia was taken too soon! This post by Whole Family Strong tells the story. Because you never know when the chance to love will be taken away. I planned on going to a Mom’s night out with our homeschool group. I decided not to go at the very last minute. I missed the opportunity to get to know this remarkable woman. Two days after that social, she was gone. That will haunt me. One day, I will see her again. Posted in Uncategorized and tagged Felicia Galloway, life and death, Missed opportunities, Whole Family Strong. Bookmark the permalink. 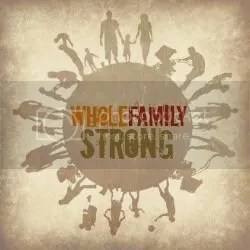 My friends over at Whole Family Strong launched their new website. Head over there and check them out. While you’re there, sign up for their emails. They have some really cool stuff coming up – maybe even some giveaways! Posted in Uncategorized and tagged Family fitness, Paleo, Whole Family Strong. Bookmark the permalink.